Two CATCH youth show their treasures after digging in the soil. 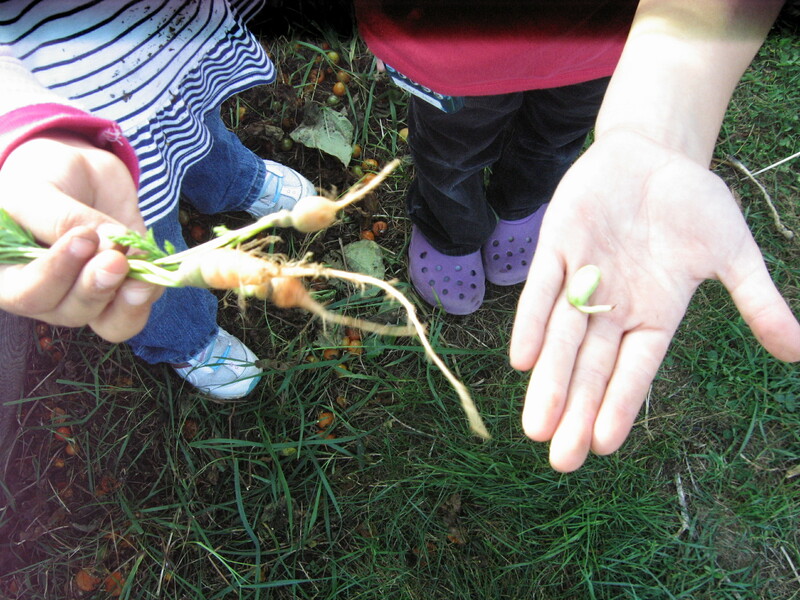 Discoveries: tiny carrots to munch on and a bean seed released from a pod ready to grow. Twelve CATCH youth pulled and picked at lingering tomato plants. Their monster pile of compost grew. Fingers enjoyed squashing tomatoes; splattering seeds clung to their clothes. As I was leaving, a group of girls asked if they could stay. If I didn’t have to dash, I’d be digging with them. This entry was posted in Keene Rec Center, Reflections. Bookmark the permalink. Hello community gardeners! My name is Danielle Couture a senior, Environmental Studies student at Keene State College. For my senior project I have been designing a proposal for more community gardens in Keene. I have put together a survey to determine the need and desire for more community gardens. The survey will take no more than 10 minutes to complete, but will benefit the city for years to come!!! Thank you for your time and interest in community gardening. Please email me at dcouture2@ksc.mailcruiser.com if you have any questions.